Though experts say the Iraqi election went smoothly, the real test will be how quickly and effectively a government is formed. (CNN) -- March's elections demonstrate Iraq is prepared to settle its differences using politics rather than bombs and bullets, experts say, but Iraqis still have a long road to a stable republic. Unofficial results suggest a tight race between Prime Minister Nuri al-Maliki's State of Law party and rival Ayad Allawi's al-Iraqia, but neither is poised to win a majority in the 325-seat Council of Representatives. Experts say that to avert government deadlock and possible violence, coalitions will be formed, concessions made and the agreement to withdraw all U.S. troops by 2012 reconsidered. "Can Iraqis move forward with politics as a tool? I think yes," said retired Army Col. Pete Mansoor, a former executive officer to Gen. David Petraeus now teaching military history at Ohio State University. "The Iraqi people saw in 2006 and 2007 what sectarianism could do to their country." Good signs abound, experts say. Turnout was high, estimated at between 60 percent and 65 percent. Violence was lower than expected, despite 38 killings on Election Day. 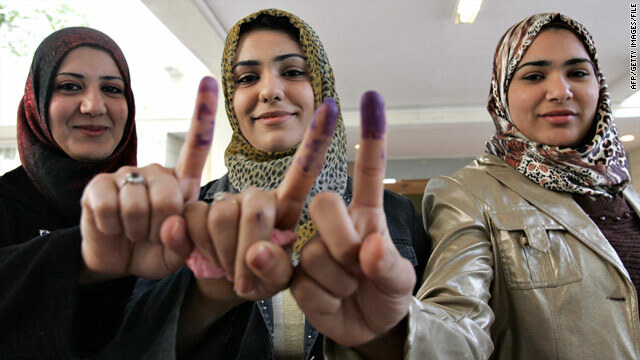 Secular parties had strong showings in several provinces, and the long-dominant Iraqi National Alliance, a Shiite-dominated party backed by Iran, is performing well in only three of Iraq's 18 provinces, according to unofficial vote tallies. Voting irregularities were reported, but overall the elections were "fairly fair and transparent -- as much as any election in the Third World has been," Mansoor said. Brett McGurk, who served on the National Security Council staff under Presidents Obama and George W. Bush, said he'd give the election's logistics and security an "A." Iraqi police and security forces maintained order with minimal assistance from the 115,000 U.S. troops, who stayed largely on base, he said. "Four years ago, if you would've asked if the Iraqis could do this on their own, a lot of people would have said no," said McGurk, a fellow with the Council on Foreign Relations. Where Iraq gets lower grades -- a "B-" or "C+" -- is in moving from identity-based politics to a brand centering on tangible issues, he said. Many Iraqis remain loyal to tribal or ideological allegiances, but McGurk and Mansoor said early election results indicate a populace seeking different ideas in leadership. "Iraqis really want a system in which they're actively engaged in their own politics and holding their leaders accountable," McGurk said. Mansoor agreed. "There's still a conflict over power and resources, but it's moved back to the political realm, which is a good thing," he said. The elections featured more than 6,000 candidates representing about 80 political entities -- some new, some old, some offshoots -- and fractures have developed within the Shiite, Sunni and Kurd blocs whose coalitions hold the top offices. The largely Shiite State of Law and the secular al-Iraqia hold the most sway, according to early results, but getting al-Maliki and Allawi to unite will be difficult. The ruling coalition could eventually be comprised of as many as four parties, which will have to approve a president, the new government and its platform, McGurk said. "Maliki and Allawi just hate each other so that's going to be hard," he said. "It will be hard for them to bury the hatchet for the good of the country. They'll try to chip away underneath." The maneuvering could take months -- it took six in 2005 -- and Mansoor said that a disastrous attempt to form a government is "one of the few ways Iraq can revert back to a condition where people are fighting with bombs and bullets over power and resources." McGurk pointed out that it was nine weeks after the 2005 elections that the revered Shiite "Golden Mosque" in Samarra was attacked, setting off a fit of Sunni-Shiite violence that killed thousands. Before the March 7 elections, think tanks expressed concern about similar violence. Election primers by the Heritage Foundation's James Phillips and The Brookings Institution's Kenneth Pollack warned that torpid government formation following the election could paralyze services and exacerbate ideological rivalries. Violence -- and at worst, civil war -- could ensue. 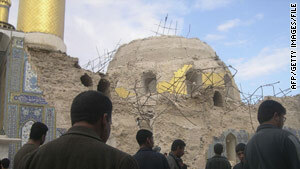 The bombing of Samarra's Golden Mosque in 2006 set off a wave of post-election violence in Iraq. "The most dangerous scenario is one in which all four of the leading blocs garners a roughly equal vote, raising the potential for long-term deadlock and renewed violence among parties, sects and ethnicities. That is the most likely route to civil war," wrote Pollack, the director of Brookings' Saban Center for Middle East Policy. McGurk said he believes violence is a lesser threat now than it was in 2005 because no real state apparatus existed then, whereas al-Maliki's government will act as caretaker until new representatives are in place. Improved security forces are a boon, too, McGurk and other experts say, but they also said that the police and armed forces will need significant U.S. assistance well past the December 2011 deadline to bring troops home. "It's always been anticipated that whoever the next government is, is going to ask us to stay longer," said McGurk, who led negotiations on the Status of Forces Agreement by which U.S. forces will end combat operations in August and leave the country by 2012. Iraq must request the forces stay. McGurk said he could envision up to 30,000 troops remaining in Iraq to train, equip and advise security forces, but given the economy and the war's unpopularity, it will be difficult to muster half that. 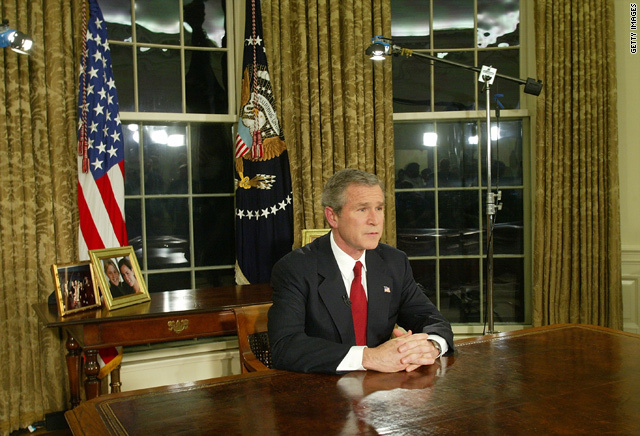 "Anything above 15,000 would be very tough within our own domestic politics," he said. Phillips, a senior fellow for Middle Eastern Affairs at the Heritage Foundation, wrote that delays in holding elections necessitate a prolonged U.S. presence for the "sensitive post-election period." It's going to take a generation or maybe two for anguish over what happened in the last few years to subside. He also wrote that the Iraqi army and police would likely not be ready to "stand on their own" come 2012 and "substantial air support, logistics, intelligence, reconnaissance, communications, training and advisory support will still be required long after that date." Mansoor cited another bonus in keeping some troops on the ground: "Having U.S. advisers embedded in the Iraqi military to make sure the Iraqis stay on track keeps U.S. interests at heart." Should the Iraqi government begin showing signs of stability, bolstering its economy is less complicated, McGurk said. Iraq is already doling out contracts to companies hungry to tap into its 115 billion barrels of known oil reserves, and there are predictions the nation could begin rivaling Saudi Arabia's oil output in a decade. "Iraq is going to be a very wealthy country," McGurk said. Iraqis will have to learn to share resources to make the new government work. They also have to hammer out issues like the balance of power between Baghdad and the provinces, establish basic institutions -- whether they be utilities or courthouses -- and fend off attacks from the decimated al Qaeda in Iraq, Iranian-backed militias and other groups that could foment violence, experts say. But don't expect anything bordering on so-called reconciliation, not in this lifetime, McGurk and Mansoor said. Religious and ideological divisions will continue to persist and grudges thrive in a country plagued so long by violence and hardship. "It's going to take a generation or maybe two for anguish over what happened in the last few years to subside," Mansoor said.